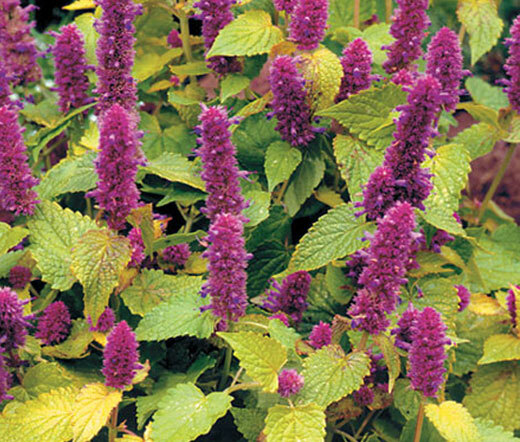 Anise Hyssop Golden Jubilee Agastache Foeniculum is a herbaceous perennial with an upright spreading habit. Other common name of this plant is Licorice Mint, and Anise Hyssop Golden Jubilee can be established from seeds. This award winning variety of Anise Hyssop has attractive, golden-green, fragrant foliage with pointy leaves and blooms with beautiful spikes of lightly-scented, powder-blue, purple flowers which are irresistible to bees, hummingbirds and butterflies. Anise Hyssop Golden Jubilee makes a superb flowering herb for butterfly and herb gardens, meadows and wildflower gardens, borders and containers. Agastache Foeniculum grows best in full sun or partial shade preferring moist but well drained soil, and it is known as a low maintenance perennial herb that does not have any significant negative characteristics. Anise Hyssop is an outstanding cut flower.